Monster Energy Yamaha rider Cal Crutchlow enjoyed his best ever MotoGP result at Le Mans today, securing second position in wet conditions. Just 24 hours after a crash in FP4 in which he fractured his right shin, the wet conditions helped the 27 year old by easing the stress put on his body. Crutchlow was down in seventh position on the opening lap, but a series of fastest laps soon pushed him through the field. 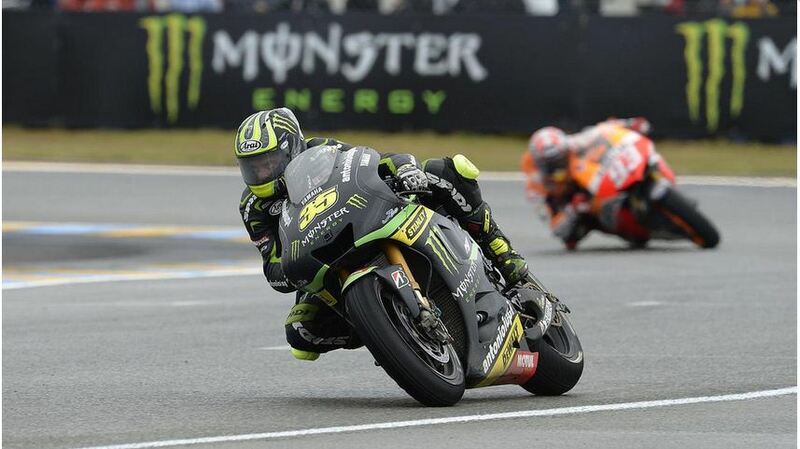 Visibility proved to be a problem for Crutchlow, however he soon gained confidence and was able to fight Valentino Rossi for third position on lap 13. With just 5 laps to go, Cal was up with previous race leader Andrea Dovizioso who soon cracked under the pressure and slipped behind his former teammate, leaving Crutchlow in second position. Monster Energy Yamaha Tech3 teammate Bradley Smith put in an impressive performance on his YZR-M1, coming back from being dead last at turn one to finish the race in ninth position. Le Mans was Smith’s first ever MotoGP race in the wet and it didn’t take long for his confidence to grow in the slippery conditions, after a big rear tyre slide hindered the 22 year old coming off the line Smith re-grouped and worked his way through the pack to equal his best finish of the season. Previous Previous post: Moto2 & Moto3 round up: Redding storms to first Moto2 win, Vinales controls Moto3. Next Next post: Laverty "I felt like a fish out of water"